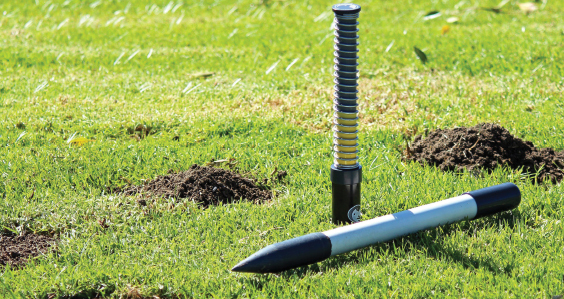 Oxnard’s Meissner Industries makes the GopherHawk, a trap that catches and kills gophers without using poison. If only Bill Murray had a GopherHawk. The Oxnard family that operates Meissner Industries is out to solve a pesky problem for homeowners, golfers and agriculturalists. As anyone who’s tried to catch a gopher (or seen the Bill Murray movie) knows, gopher traps can be labor intensive. They involve digging at both ends of a gopher tunnel, covering the traps, waiting for a gopher to come snooping around and then digging them back up to check. Paul Meissner set out to eliminate every step of that process. His father decided to make the trap vertical, instead of linear with the tunnel. A probe pokes into the ground until it finds the tunnel, then an auger bores a hole the size of the cylindrical trapping mechanism, which sets a snare using a spring. When the trigger is moved it snaps up, killing the gopher quickly and displaying an indicator above ground so the owner can remove it. When Jim Burnett first bought his Arroyo Grande property eight years ago, it was completely overrun, he said. Many days spent setting traditional traps later, he stumbled on GopherHawk in a hardware store and decided to try one out. His organic specialty farm grows 45 varieties of citrus, stone and subtropical fruits like Passion Fruit and Jamaican allspice. To maintain his organic certification, Burnett couldn’t use poison or baits. He’d lost several trees and vines to the creatures, including three blue agave cacti they ate when he’d chased them away from some of his higher value crops. When it started, the GopherHawk team created the product by hand and tested it at nearby farms. Debuted in 2014, it is now manufactured by 12 employees at the Meissner Industries’ 14,000-square-foot Statham Parkway facility and distributed in 40 states. Meissner Industries previously manufactured other equipment, said daughter Jeanette Meissner-Brent, including filters that it still produces. The team complements one another well, McAtee said, with their mix of experience in sales, design, engineering and management. The company sells through Amazon, in some multi-store locations and direct-to-consumer from its website. It also has contracts with Do it Best, True Value and Mid-States out of Minnesota. Earlier this year, Ace Hardware announced it will warehouse GopherHawk on the West Coast after it acquired a company that warehoused the product for 2,000 stores. While gophers are considered pests in only 22 states, all 48 in the continental U.S. have moles — so the company recently rebranded the product to open up the new market. It usually sells a few thousand a month, depending on the season, but its manufacturing operations can expand easily as demand increases, McAtee said. The company has rolled GopherHawk out to all of its technicians, especially because it doesn’t involve baits or poisons, minimizing its impact on the environment. Its lack of chemical deterrents meant Meissner Industries didn’t need certification for the product, Meissner-Brent said, but it still reached out to the Organic Materials Review Institute and got a nod of approval for organic farmers.